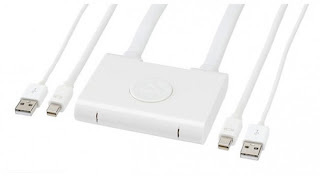 Kanex SnapX comes with 2 mini Display Port connection, 2x USB ports and two wires that have been integrated which can help you connect 2 devices Mac into an Apple monitor display device. Kanex SnapX can be used for the two Apple devices like the Macbook, MacMini, or iMac and want to combine them into one monitor, Kanex SnapX presence will help you realize it. How it works is also relatively quick and easy. 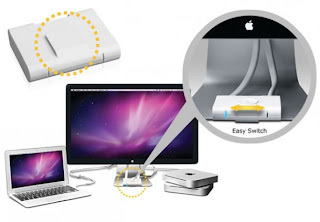 Without requiring an electrical current, you simply connect the Apple device with Apple's monitor screen through Kanex SnapX and to the displacement by simply pressing the button on Kanex SnapX then you will move from the Mac one to the other.